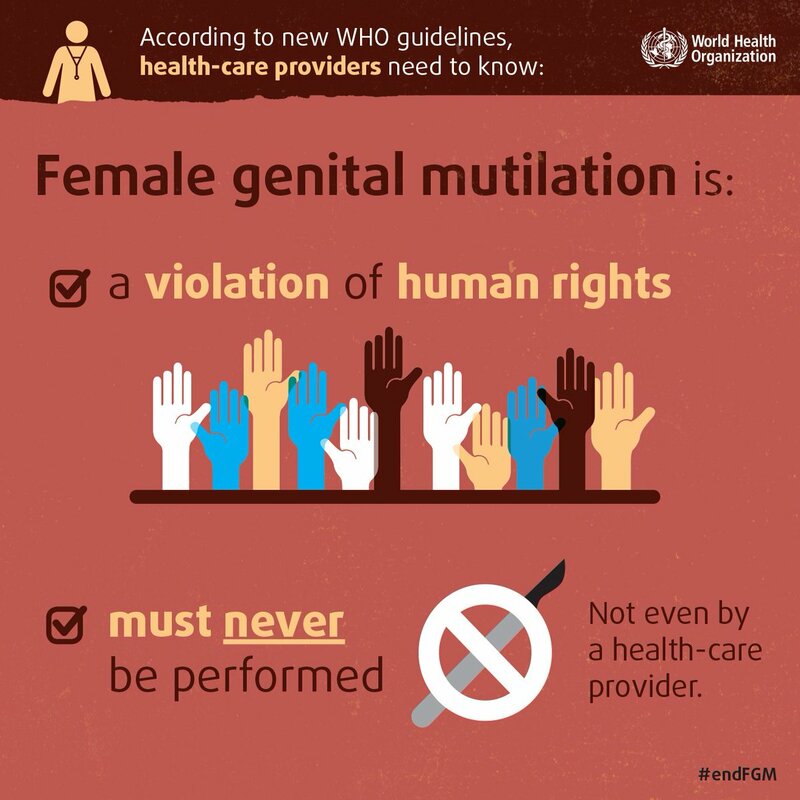 Female Genital Mutilation (FGM) is defined by the WHO as “all procedures that involve partial or total removal of the external female genitalia, or other injury to the female genital organs for non-medical reasons.” A majority of the time, FGM is performed with a razor blade on girls between the ages of 4 and 12, traditionally without anaesthetic. It has no reported health benefits and can cause harm to a woman’s health both in the short term and long term. What is the relationship between FGM and health and human rights? ● Life (when the procedure results in death). One of the more prominent UN treaties that protects women’s rights with regards to FGM is the Convention on the Elimination of all forms of Discrimination against Women (CEDAW). In its General Recommendation No.14 (1990) it explicitly states the need to “take appropriate and effective measures with a view to eradicating the practice of female circumcision”. The WHO, in collaboration with various other UN agencies, has developed a global strategy which emphasises the integral role that healthcare professionals play in the eradication of FGM. The UN General General Assembly has also called upon states to ratify or accede to CEDAW, in its January 2002 Resolution on Traditional or Customary Practices affecting the health of women and girls. The UNFPA-UNICEF Joint programme on FGM/C – the largest global programme to accelerate the abandonment of FGM. They are in partnership with grass-roots organisations and take a human rights-based and culturally sensitive approach. So far, they have trained up to 100,000 health practitioners on FGM prevention, response and care. END FGM European Network – this organisation is an European umbrella organisation set up by 11 national NGOs to ensure sustainable European action to end FGM. One of the main actions they have taken is to advocate the issue of FGM to be included in EU policies and legislation on asylum, justice, and gender equality. 28 Too Many – This is an African-based organisation whose primary focus is on research and enabling local initiatives to end FGM in the 28 African countries where it is practised and across the diaspora. FORWARD – Foundation for Women’s Health, Research And Development. FORWARD is an African Diaspora network that strives to tackle FGM, child marriage and gender-based violence through educational workshops, advocacy, support programmes and information sharing. It is the leading organisation in the UK to tackle FGM, and works on a strategic level in Europe and Africa. What are the relevant issues with regards to FGM? Medical complications – Some of the main complications that arise are severe bleeding, tetanus, inability to urinate, complications during childbirth, and even a high risk of HIV infection due to the use of unsterilized equipment. Mental issues – Women and girls can suffer varying degrees of trauma, depressions, lack of bodily well-being, post-traumatic shock, and loss of trust. Cultural barriers/social stigma – Young women may be outcast from communities or deemed ‘not marriable’ if they do not undergo circumcision. It’s often seen that the consequences of FGM are a lesser evil than the economic and emotional hardship suffered if remained unmarried. What is the special responsibility of health workers in this regard? Health workers can be central figures in communities where FGM is a common practice, so they could potentially use their influence to advocate against FGM and promote this message in a respectful and culturally sensitive manner. They are also in a position of providing medical help and potential counselling for girls who have undergone FGM, and are in need for social or psychological support. Health workers can also contribute to raising awareness and generating further knowledge and understanding of the practice, which in turn can educate and empower those who wish to help eliminate the practice. By taking a stand and refraining from carrying out female circumcisions, healthcare providers can contribute to the increasing debate and questioning of the practice by communities. This page was written by Amreen Qureshi in September 2015.